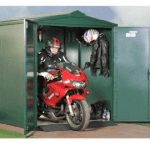 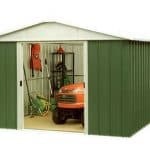 The perfect shed for those not wanting to suffer quality for price, this unit is made to last. 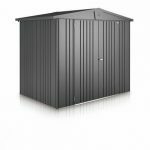 With a pent roof that easily keep rain from piling high, and a shiny zinc-plated finish that won’t rust, you can feel secure that this shed will last for well beyond its years without needing any finishes. 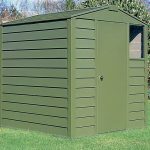 Sturdy stainless steel frame and cladding also hold this shed up and in great form, without rusting away. 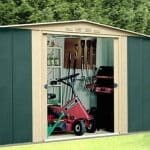 The 5’11” x 3’4” of space is just right for putting away your outdoor essentials and recreational equipment. 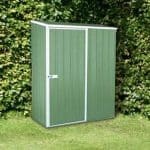 It easily fits into any corner of your garden and takes up little space.